When you donate household goods to Goodwill, you set into motion a circle of good that is transformed into dignity, hope, and empowerment for people in need. Visit one of our convenient donation drop-off locations today! Many locations throughout Denver feature an easy drive-through feature—you won’t even need to get out of the car! Your donations can help struggling individuals’ dreams set sail. 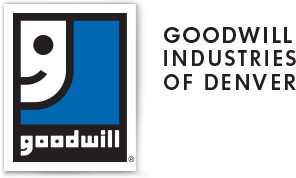 By donating used clothing and household furniture to Goodwill thrift stores—more than 90 cents of every dollar will go to support Goodwill’s Career Development Programs that help Coloradans find work, opportunities, and a path to a successful future. Donating gently used goods reduces clutter in your home and waste in our landfills. By donating your old, unused, or non-working electronics to Goodwill, you're being proactive to ensure that harmful chemicals are recycled responsibly. Plus, you’ll be providing jobs for individuals with disabilities. As a residential computer user, you can recycle computer equipment for free thanks to the Dell Reconnect™ program. Dell’s stringent environmental standards prevent dumping of electronic waste in developing countries. All you have to do is take your unwanted computer and components—any brand, in any condition—to your local Goodwill retail store or donation center. Learn more about Dell Reconnect™ here. Out with the old, in with the new. If your used furniture is still comfortable and has been gently used, don’t throw it away! Consider donating your furniture to Goodwill. Goodwill accepts couches, recliners, love seats, and other items. Note: please call ahead to your location before dropping off large furniture donations. Outgrowing your clothes or considering updating your closet? Consider donating your used clothing to Goodwill. Goodwill accepts clothes in all shapes and sizes. Don’t forget clothes in your kids’ closet as well! If you have used paperback & hardback books gathering dust on your night stand or bookshelf, consider donating your old books to Goodwill to get a second look. To best support Goodwill's mission, there are certain items we can and cannot accept. Help us better serve the community and know before you go! Check out our can and cannot accept lists below. Time for taxes? Download Goodwill's Valuation Guide for pricing your used clothing and furniture donations! Learn more about how your household donations do good!